Here at Lifting Hoists Direct we don’t just supply hoisting equipment, we offer a complete range of hoist services at good value prices to ensure your hoisting equipment operates to its best ability whilst keeping it cost effective. Our hoist service packages include; hoist repairs, hoist installations, hoist inspections, hoist servicing and hoist maintenance. Why Use Our Hoist Services? Hoisting devices, in particular the powered variety are a costly piece of equipment which is why it is more prudent and cost effective to keep them fully serviced. Without hoist servicing and hoist maintenance, hoisting equipment can breakdown. Think about how your equipment is used, what would happen if your hoist was to stop working? Depending on how, where and the frequency in which your hoist is used, when it stops working it can have a major impact on your business. Not only is it inconvenient, and need to sort out repairs or replacements but the loss of production / working time can have a huge knock on effect, time is money after all. We have the capacity to acquire the majority of hoist spares and hoist parts for most major hoist brands, so our engineers can supply and fit any hoist parts required either in house or on site. We have a team of highly experienced and skilled engineers with their own work vans to enable site visits when necessary. Alternatively hoists can be sent to us or collected by us for work to be completed in our own workshops and then returned directly to you. 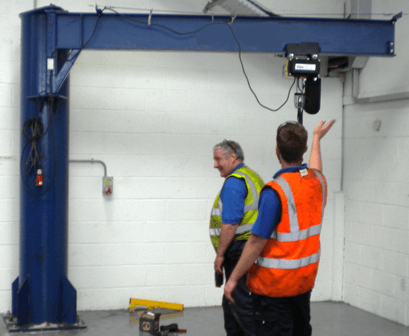 When you purchase a hoist from Lifting Hoists Direct you may like to have it professionally installed and tested to ensure everything is working as it should and safely. Our Experienced Engineers are available to undertake your hoist installation requirements. Whatever type of hoist you have, sometimes things go wrong, electric hoists loose power, manual hoists may seize up; parts become stuck, broken or just wear out with continual use. 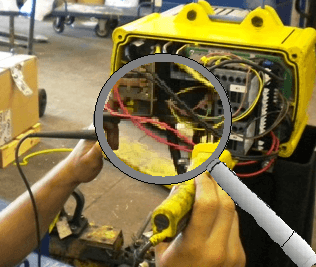 Let one of our engineers take a look, it is often the case that your hoist can be repaired, which is usually cheaper than replacing the complete device. 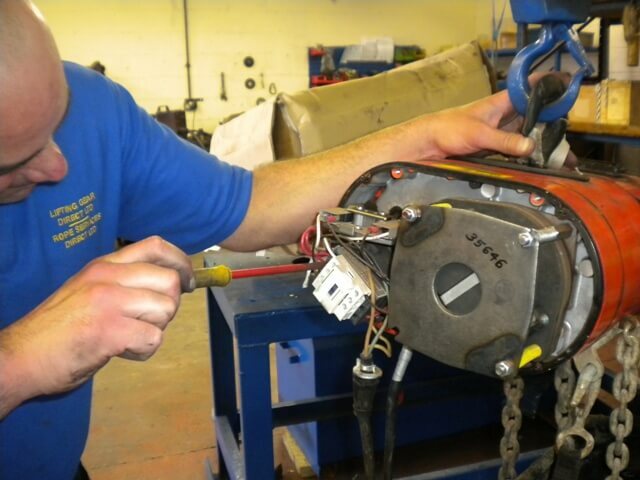 We can usually get any spare hoist parts required quickly so an engineer can complete your hoist repair rapidly. Sometimes it makes more sense to service your hoisting equipment and maintaining it on a regular basis rather than waiting for it to stop working completely. It is often the case that hoist servicing and hoist maintenance procedures are cheaper in the long run than paying for a complete new hoist. Whilst some types of hoists can be easily maintained by yourselves, some are much more difficult, especially when it comes to electric hoists, air hoists and other powered hoisting devices and is wise to get this done by an experienced person. It is commonplace, and a very good idea to have your hoist serviced at the same time as its required hoist inspection, something else our trained engineers can carry out. It is mandatory for all hoists and any other lifting equipment used to undergo a thorough inspection by a qualified person at least every 12 months. This is the maximum time span you should allow between hoist inspections. We have a team of trained inspectors who can carry out a complete and thorough hoist inspection in accordance with LOLER regulations. We issue full certification for your records, it is essential that these be kept safe for legal reasons. From years of experience we know how disruptive a broken down hoist can be to many workplaces and industries. For this reason we offer a 24 hour call out service for emergency hoist repairs. 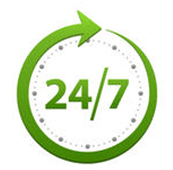 We will always endeavour to get one of our engineers to you as soon as possible and aim to get you back up and running in the shortest achievable time. Hoists are an important piece of lifting equipment in many industries, and due to the fact that they lift heavy loads, the potential for disasters should always be on your mind. A falling load can inflict serious harm, as with all things - look after your hoisting equipment and chances are it will look after you. "After realising at the last minute (as usual) that some of our lifting equipment required its bi-annual inspection and service, our usual company couldn't help. We found Lifting Hoists Direct online and gave them a call, so glad we did; came out next day and thoroughly inspected all our hoisting equipment and loose tackle; we now have up to date documentation and know our equipment is fit for purpose. Many thanks to the engineers who came out; will recommend and use again. "